In the remote community of Dhalinybuy (in North-East Arnhem Land in the Northern Territory of Australia), we have been invited to meet some of the elders. As we approach, we see a group of men and children sitting on a mat surrounding an elderly man. His chest bears the proud scars of a fully initiated Yolngu man, and his bearing and charisma tell you that he is a leader of his people. After we are invited to sit with them, the old man is introduced as "Mathulu." We are astonished. Mathulu Munyarryun? Famous ceremonial leader, custodian of ancient stories of the sky? In our multiyear quest to understand the astronomy of the Yolngu people, we have often heard tales of Venus as the morning star. But when we ask people about the corresponding Evening Star, we are told to ask Mathulu, custodian of the "Morning Star story." At last, in this remote Yolngu community of Dhalinybuy, we meet him. There used to be about 400 different Aboriginal cultures in Australia. Each had its own language, stories, and beliefs, although most were cantered on the idea that the world was created in the "Dreaming" of an ancestral spirit. The spirits left a users guide to life in their songs and stories. Aboriginal people searching for meaning in the dark skies of ancient Australia noticed that particular stars were visible only at certain times of year, and so the night sky is naturally an important chapter of this guide. The 50,000-year-old Aboriginal cultures are believed to be the oldest continuous cultures in the world. Since the night sky seems to play such an important role for them, it is sometimes said that the cultures include the earliest traces of astronomy. But astronomy is more than just stories—it means a quest to understand the stars, as well as the motions and the eclipses of the Sun, the Moon, and the planets. The goal of our research project is to understand the importance of astronomy in Aboriginal cultures, and, ultimately, to answer the question, "Were the Australian Aboriginal people the world's first astronomers?" Tragically, many of the Aboriginal cultures have been severely damaged, or even wiped out, since the arrival of Europeans. People like those in Arnhem Land have managed to keep their culture pretty well intact, and still conduct initiation ceremonies in which knowledge is passed on from one generation to the next. But in South-Eastern Australia, Aboriginal cultures were almost wiped out. Their legacy of beautiful rock engravings and stone arrangements provides us with clues to their cultures. Much traditional Aboriginal knowledge is sacred and can be given only to those who have been properly initiated. Naturally we respect this and are careful not to intrude where we are not welcome. But Aboriginal elders have encouraged us to learn a little of the knowledge and pass it on so that others may understand something of the richness and complexity of their culture. In almost all Aboriginal cultures, the Moon is male and the Sun is female. The Yolngu people tell how Walu, the Sun-woman, lights a fire each morning, bringing us dawn. As she decorates herself with red ochre, some spills onto the clouds, creating a red sunrise. The Yonglu people tell how Nglandi, the Moon-man, was originally a fat and lazy man (the full Moon), who demanded that his wives and sons feed him. When his sons refused to do so, he beat and killed them. When his wives found out, they attacked him with their axes, chopping bits out of him. As a result, he became thinner (the waning Moon) and tried to escape by following the Sun. But it was in vain, and he died of his injuries. After remaining dead for 3 days (the new Moon), he rose again, growing fat and round (the waxing Moon), until, after two weeks, his wives attacked him again. This cycle continues to this day. Other Yolngu stories explain the association between the Moon and the tides. Sailors know that tides follow the Moon, and that the highest tides occur at Full Moon and New Moon. Astronomers explain this in terms of the Moon's gravity. The traditional Yolngu explanation is that, when the tides are high, water fills the Moon as it rises through the horizon, causing a full Moon. Later, when the Moon is only half full, the tides become lower. A week later, the water runs out of the Moon, raising the tides, leaving the Moon empty for three days. Although the explanation are a little different from our modern version, traditional Aboriginal cultures contain a detailed knowledge of the Moon's effects on the Earth. Astronomers tell us that solar eclipses are caused when the Moon gets between the Sun and the Earth, blocking the Sun's light from reaching those of us on Earth. A lunar eclipse, on the other hand, happens when the Earth gets between the Sun and the Moon, casting the Earth's shadow on the Moon. Total lunar eclipses are quite common and are visible every few years. Solar eclipses, however, are rare. A total solar eclipse is visible in any one location only once every 370 years, so most people living there will never see one. It is surprising then that Aboriginal stories contain explanations of both solar and lunar eclipses. The people of North-West Arnhem Land say a solar eclipse happens when the Sun-woman is hidden by the Moon-man as he makes love to her. On the other hand, a lunar eclipse occurs when the Moon-man is pursued and overtaken by the Sun-woman. The two stories demonstrate that traditional Aboriginal people had already figured out that the Sun and Moon move on different paths across the sky, and that eclipses occur on those rare occasions when the two bodies meet at the intersection of their paths. The stories of solar eclipses imply an amazing continuity of culture and learning over many generations, passed orally by individuals who probably would never see an actual eclipse in their lifetimes. The silvery glow of Venus, the Morning Star, must be one of the most spectacular sights in the sky. It is extremely important to Yolngu people, who call her Banumbirr, and tell how in the Dreaming she came across the ocean from the East, from the Island of the Dead, Baralku. As she crossed the shoreline near Yirrkala, Banumbirr named and created the animals and places. The path that she followed is now traced by a "songline" which is still commemorated in Yolngu songs and ceremonies, and provides a navigational route across the Top End of Australia. Unlike the planets Mars and Jupiter, which travel across the sky, the planet Venus is only seen close to the Sun, either as a Morning Star rising just before dawn, or as an Evening Star just after sunset. Modern astronomers explain this in terms of the orbits of the planets around the Sun. Yolngu People, thousands of years ago, came up with a different explanation. When Venus rises before dawn, a rope is said to connect her to the island of Baralku. This rope is said to prevent her moving too far away from the Sun. Yolngu people say that if you look carefully, you can see this rope. They seem to be referring to the faint glowing line in the sky that astronomers call the zodiacal light, caused by interplanetary dust in the solar system. Although difficult to see in most parts of the world, it is easily visible in the clear dark skies and low latitudes of northern Australia. 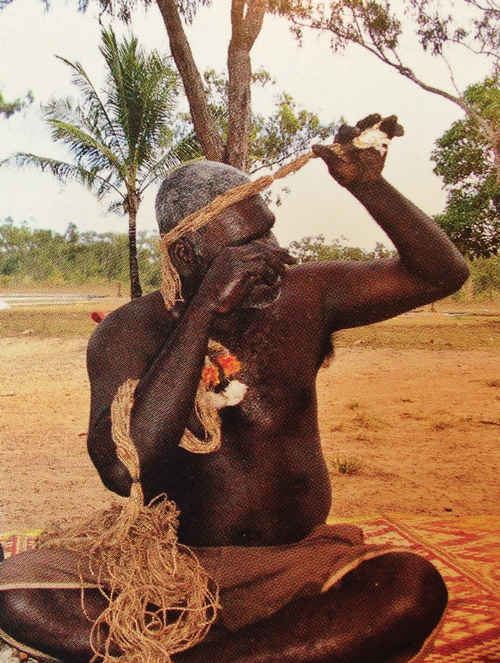 Some Yolngu clans still hold an important "Morning Star Ceremony" as part of the funeral process. This ceremony starts at dusk and continues to a climax as Banumbirr rises before dawn. During the ceremony, a "Morning Star Pole" is used to help the participants communicate with their ancestors, with Banumbirr's help. The messages are said to be carried along the rope which connects Banumbirr to Baralku, where the ancestors live. We can learn two important things from the Morning Star ceremony. One is that the Yolngu tradition includes the knowledge that Venus never moves from the Sun. The other is that since Venus rises before dawn only at certain times (roughly once every 1.5 years), Yolngu people also keep track of the path of Venus well enough to predict when to start planning and hold the ceremony. What of the Evening Star? When Venus rises after the Sun, it is not visible in the glare of the morning daylight. However, at those times of the year it sets after the Sun, and then is visible as a bright star in the West after sunset—the Evening Star. The Yolngu people have a story about the Evening Star, but it is puzzling. It says that when the Evening Star, named Djurrpun, is visible, it is the time to harvest raika, the Lotus bulbs that grow in Arnhem Land. But that doesn't make sense—Venus would not be good for telling you when to harvest raika, as the time Venus sets changes from year to year, reappearing in the same apparent position only after a period of 584 days. Mathulu, we were told, was the owner of this story, and the only person who could explain it. His story started: "A lady went out to a waterhole, and she sat collecting raika nuts. When Djurrpun sets just after the Sun, we know that raika, the nuts from the rushes in the river, are ready to be harvested." Then the conversation took an unexpected twist. From a bag, he produced a long rope. "This is Laka, an Evening Star Rope," Mathulu told us. We were amazed. We had spent the last couple of years reading the literature on Yolngu culture and had never before heard of the Laka. "It's a line of stars in the sky, and when the first star sets just after sunset, that's the time for the women to collect raika nuts," examined Mathulu. He let us examine the rope, made of pandanus twine, twisted together with oissufur and orange lorikeets feathers. Woven into the rope were the yellow-white marbles of the raika nuts. "This Laka is a memorial to my grandmother, and we used it at her funeral to send her spirit off to the evening star. Like this." Together, he and a younger man translating for us demonstrated how a line of mourners held the rope on a their heads, joining their spirits to that of their grandmother and they say farewell. Walking back, we asked Mathulu which was the Evening Star. "That one," he pronounced confidently, pointing at the star Spica. Spica sets behind the Sun in October, just before the raika harvest. The anthropology books which identify Djurrpun as Venus were just plain wrong. Finally the puzzle was solved. The editor adapted this story from materials provided by Cilla and Ray Norris. For more details on the work of Cilla and Ray Norris and their collaborators, visit their site, Australian Aboriginal Astronomy, at www.emudreaming.com. We know that traditional aboriginal people were interested in the sky and used the stars for time keeping and navigation. They had a deep and extensive knowledge of the sky, and of the motion of the celestial bodies across it. Perhaps they were even making accurate measurements of the rising and setting places of the Sun. But we are only in the early stages of this study, and it is likely that far more lies undiscovered. Why should we be interested in aboriginal astronomy? Personal curiosity, certainly. But it goes much deeper. If we succeed in uncovering ancient aboriginal astronomers, perhaps in a way we can give back to the aboriginal people some of that culture which our European ancestors destroyed. Also we hope that, like music and art, astronomy can build an important bridge of understanding between indigenous and non-indigenous Australians. We all share the same sky and can’t help being awed by the beauty and mystery of the glorious Milky Way stretching across the unknowable black heavens above us. We aim to promote a greater appreciation of the depth and richness of indigenous Australian cultures. Ray Norris is an astrophysicist at the Australia Telescope National Facility (operated by Australia’s Commonwealth Scientific and Industrial Research Organisation, or CSIRO). His wife, Cilla Norris, is an authority on possums, writing and teaching about the animals for the New South Wales Wildlife Information and Rescue Service (WIRES) and other groups.